In Cambodia, there have been great gains in reducing the morbidity and fatality of malaria. In 2015 there were only 10 reported deaths from malaria. Over 80% of cases occurred amongst people age 15-49. Although this age group is often less vulnerable, they also often comprise the primary breadwinners of families and thus each case of malaria means a loss of precious income through payment for treatment or lost labor time. In addition, drug-resistant strains of the disease have been on the rise in the border regions of the country. This can be caused by exposure to poor quality medicine, or more commonly failure to comply with medication directions. Mobile and migrant workers are particularly at risk because they work in the wooded border regions of Cambodia with high incidence, they often come from areas with less incidence of malaria, and they often work through the night. PfD is working with the Global Fund in Kratie province to create an Early Warning System which will create a database tracking the emergence of drug-resistant cases. In order to do this, a network of PfD staff, volunteers, and partners have to draw and test blood samples from patients, and submit them for verification. It is this network that is the heart of PfD’s Regional Artemisinin Project. 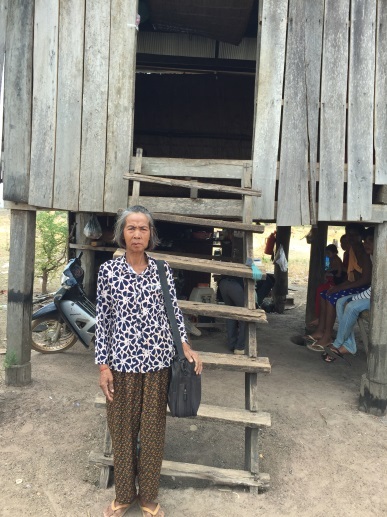 Kratie is among the poorest provinces in Cambodia, so those who contract malaria are sometimes unable to afford a visit to a private clinic. However, if they do choose the private clinic route, they will have the pleasure of seeing Miss Ry Monika. At her clinic, she will administer medicine and take a blood sample for a PfD staff member to collect. At this private clinic, the policy does not include a follow up with the patients. Reaching patients after they leave can be a key challenge, as many do not have phones or adequate service. If a patient makes their way to the public clinic, Mr. Ra Sarvuth will take a blood sample and request the patient returns in 2 weeks. During this time, the blood sample has been collected by PfD staff and analyzed. Mr. Sarvuth works diligently to contact those who do not return. With the help of trained Volunteer Malaria Workers (VMWs), all who need assistance can be treated and tested. Bin Soth has been a VMW since 2004 and has worked diligently with PfD on other malaria control programs like net distribution and education campaigns. He has been trained by PfD on health education and behavior change communication (BCC) and has also been trained and provided medicines by the national program. Bin Soth also collects blood samples which are collected by PfD staff. If the malaria is a serious case or doesn’t improve then he refers the patient on to further care at a hospital or health center. Within the village that Bin Soth works and lives, he covers about 75 families over an area of 2-3km. Tin Tak has been a VMW since 2004 in the village of Batheuy, where her coverage area is about 3km. Like Bin Soth, Tin Tak takes blood samples for PfD to collect and she refers more complex cases and pregnant women on to hospitals and health clinics. However, the nearest health center is 23km away and the road in very poor condition. Therefore, the work she does in her community is vital to those who cannot make that trip. Our VMWs are passionate about serving their friends, family and communities. They are proud to make every PfD meeting to keep current on our malaria prevention and control programs. 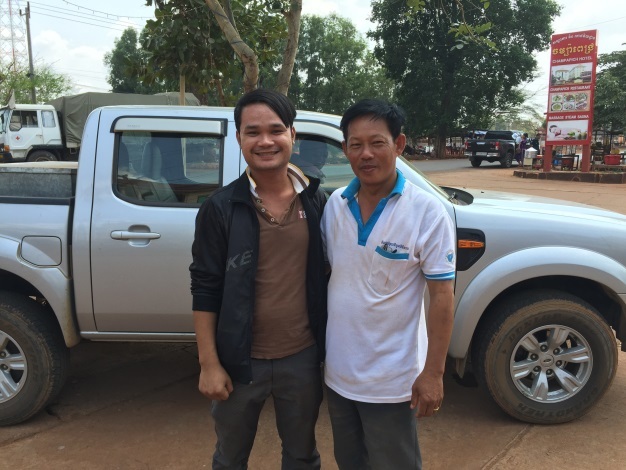 Their service has been invaluable to beneficiaries like Sreang Thavy. 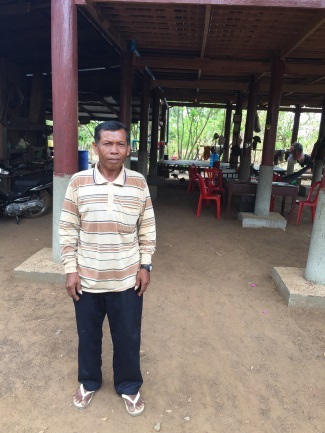 Sreang Thavy has repeatedly contracted malaria due to his work in the nearby forest. When we met Sreang, he was sick for the 3rd time in just one year. After returning home from the forest, he was feeling very sick with a fever. At that point he knew he had to go to the local health post where they took a blood sample. It takes a while to recover enough strength to return to working in the forest, and this time can be economically damaging as he is unable to work and his family of 7 has no other source of income. Working tirelessly to prevent malaria in their community is PfD’s local staff based in Kratie province, such as Kheng Phyreth and Im Ratana. They map beneficiaries, collect samples from the clinics and VMWs, and maintain relationships with our partners. They often work long hours, having to reach remote areas on motorcycle. They are key members of the PfD team, working at the local level to achieve sustainable outcomes. I first learned about PfD when PfD conducted malaria event and malaria education activity in my village using mobile video show. PfD also conducted many other community programs and training such as WASH, nutrition, child survival, agriculture, and chicken raising in my community. In 2013, PfD selected and trained me as Mobile Malaria Worker where I gained the knowledge and skills to provide malaria health education, diagnosis and treatment to my community members. I am so proud to do this volunteer work. I have gained a lot of recognition and respect from the community members, my family, health center staff and the local authorities. I was so impressed with the malaria education activity; it informed and educated me and the community members on how to protect ourselves from malaria and where we can seek treatment when we are infected. Because I live in a malaria endemic village with lack of clean water, I am particularly passionate about malaria and WASH program of PfD’s work. Our work saved our lives. 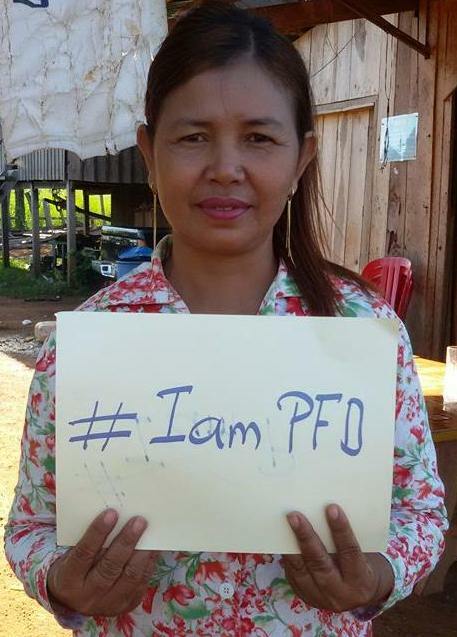 I think others should join the PfD family because PfD is the oldest NGO in Kratie Province in Cambodia and is implementing community development work to improve the quality and save lives of community members, particularly the vulnerable ones. Throughout all of December we will be sharing stories from our staff, board, partners, and others from around the globe. We can’t wait to share all of the hopeful, engaging, and positive stories from our work. We will be using the hashtag #IamPfD on Facebook, Twitter and LinkedIn. Be sure to share the posts that you find engaging and inspiring with friends and family and don’t forget to donate and take an #unselfie of you making a donation and share it with us and use the #IamPfD for a chance to win prizes from PfD. Partners for Development (PfD) came to my attention in 2011 when the PfD Board Chair wrote to me after watching myTED Talk about “Escaping the Khmer Rouge” (see below). At the time I taught at the US Naval Postgraduate School. 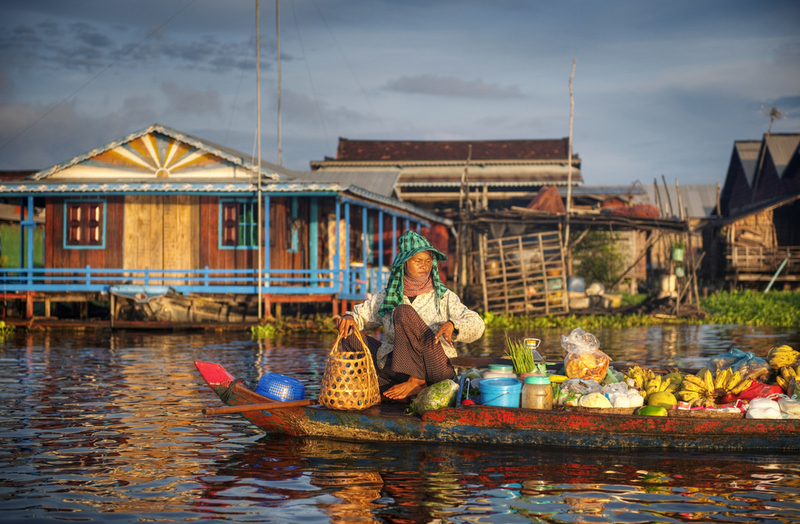 The connection was that PfD had long worked in Cambodia since the early 1990s, when the country emerged from conflict following the Paris Peace Accords of 1991. It was fitting that someone like myself, a refugee from Cambodia who escaped thanks to my late mother’s cunning and determination in 1976, one year into the reign of the Khmer Rouge, would go on to work at the World Bank and the United Nations Development Programme. But what’s even more interesting is that after years of working for international bureaucracies, I became a scholar and critic of traditional development assistance and came to see the important work that PfD does working with vulnerable and underserved populations in developing countries to improve their quality of life. I joined PfD’s Board in 2013, the same year I published Aid Dependence in Cambodia: How Foreign Assistance Undermines Democracy. Earlier this year, I even gave a book talk at PfD headquarters. Be sure to join our mailing list to be invited to future events like these. PfD is not afraid of introspection and looking at what works, what doesn’t, and why. I could already see the importance of PfD’s work in 2012 when, as a Trustee of the Nathan Cummings Foundation, I arranged a large Board Recommended Grant for PfD. 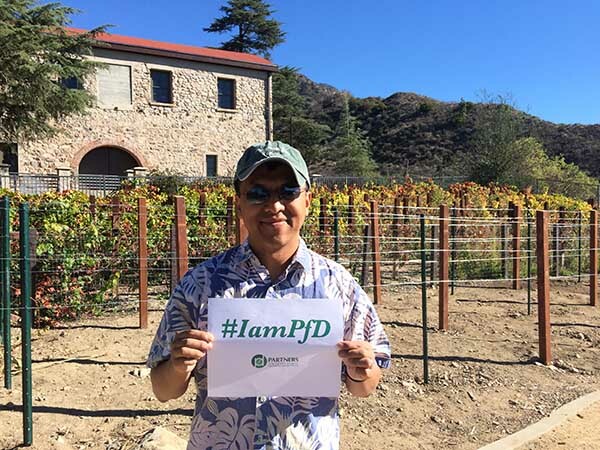 Indeed, it’s a pleasure to work with PfD and to serve as a Trustee; the team is small and responsive, squeezing the most value out of your dollars for maximum impact in the field. Partners for Development isn’t just a name, it’s a philosophy that gives the greatest importance to the role of partners in every aspect of our work. This includes a deep commitment to involving local counterparts in needs assessments, program design, and implementation. I’m in, and I think you should be too. Donate to PfD today! Ms. Nub Chin and her family currently live in the malaria endemic forest village of Chhour Krang in Thmey commune, Snoul district, Kratie Province. With her family she lives in a village impacted by deforestation and climate change. Many of her fellow villagers are smallholder farmers who work on their farms daily in order to make a living. Malaria significantly impacts their work-life when it goes untreated. Although malaria is easy to treat, it is a problem for many, like the Chin family, who do not have access to health center or health practitioners. Like many in her village, Ms. Nub Chin has personally experienced dealt with malaria. Ms. Nub Chin and her daughter frequently got malaria in part because they didn’t understand the causes of it nor did they know how to prevent it. They believed that a spirit caused malaria and sought treatment from a traditional healer (Kru Khmer) leaving their condition un-treated. When they got sick with malaria, Ms. Nub Chin and her family were left with two options: 1. Spend a lot of money on transportation to reach the public health center dozens of kilometers away or 2. Seek treatment from the private health provider which is closer, but more expensive. Ms. Nub Chin was motivated to change this! 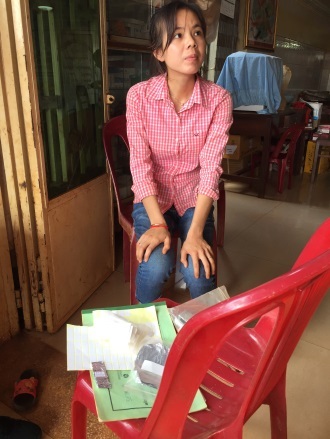 After attending the malaria health education training provided by PfD, Ms. Nub Chin learned about the cause of malaria infection and treatment options. After the training, she expressed interest in volunteering to help her village. 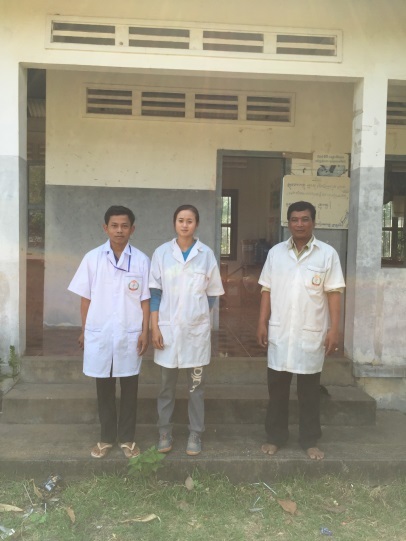 With training and support from PfD, Ms. Nub Chin became a Village Malaria Worker. As a Village Malaria Worker, Ms. Nub Chin has not only helped protect her family from malaria infections, but she has helped all the villagers, particularly the vulnerable ones, from malaria infections. In addition, she is able to save the money that she would have spent previously on malaria treatment. Ms. Nub Chin is not only a trained Village Malaria Worker who provides malaria education, diagnosis and treatment in her village, but she has also offered to take her motorcycle to other nearby villages to provide education, diagnosis and treatment to other key affected population such as forest workers, seasonal migrant workers and smallholder farmers. In the simplest of terms, Ms. Nub Chin is saving lives. Her motivation and dedication have helped prevent and treat hundreds of malaria cases. 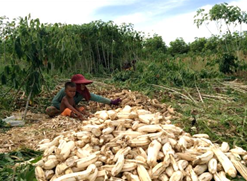 Because of women like Ms. Nub Chin, families in her village and surrounding villages are able to continue farming and save the money that would have otherwise been spent on malaria treatment to help feed their families and educate their children. Per month, Ms. Nub Chin provides health education to about 20 villagers on average, conducts around five blood tests among malaria suspected cases to screen for malaria, and provides treatment to all confirmed malaria cases. Only with the leadership and dedication of local volunteers will we be able to tackle some of the biggest health challenges facing our world today. PfD strongly believes that Ms. Nub Chin is an example of the dozens of other local volunteers in Cambodia and around the world. What are the signs or symptoms of malaria? How do people get malaria? How do people prevent malaria? These questions were recently asked as part of a Knowledge, Attitude, and Practice survey conducted by PFD in the Kratie and Koh Kong provinces of Cambodia. Our goal: to determine what the malaria affected populations knew about the mosquito-borne infectious disease. PFD is now using the data to get a better picture of the needs of the mobile and migrant populations (MMP) and, as a result, implementing better targeted programs. 97% of the workers have heard of malaria. When asked about the signs and symptoms that make them suspect malaria, 84% mentioned chills, 21.7% headache, almost 20% fever and about 16% sweating. 8.4% of respondents didn’t know signs or symptoms related to malaria. 92% of workers have at least one type of mosquito net (bed net or hammock net), but only half of those nets are insecticide treated nets (ITN). An estimated 69% of the workers slept under a treated net the previous night: 23% slept under an ITN bed net or hammock net and 46% under a long lasting insecticide-treated net (LLIN). Only 39% of workers own either an ITN or an LLIN and slept under it the previous night. Currently, PFD is working to eliminate malaria in Cambodia with funding from the Global Fund to Fight AIDS, Tuberculosis and Malaria. An integral part of PFD’s program is distributing insecticide-treated bed nets (ITNs). According to the CDC, ITNs have been shown to be very effective in the fight against malaria. Since the use of nets reduce the number of mosquitos and the mosquitos’ lifespan, if used by over 50 percent of a community, the nets will have a positive effect, helping to even protect those community members without nets. Since 2006, PFD has distributed nets which cover over 120,000 people in the Kratie and Koh Kong provinces in Cambodia. To address the areas of weakness identified through the survey, our current programs will be modified to help increase ownership of bed nets and providing on-site programs to treat nets with insecticide. PFD is committed to continually monitoring and evaluating the local needs of the community along with the effectiveness of our interventions, and through this survey, can be at the forefront of developing new intervention strategies tailored to specific populations. 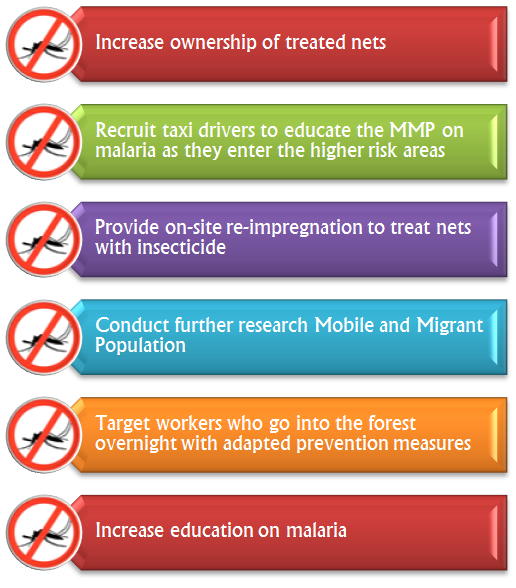 In recent years, PFD has focused on the mobile and migrant populations (MMP) who are at higher risk for malaria from their work in forest areas. Based on the 2008 census, it was estimated that 40,000 to 70,000 people migrated to malaria villages or areas, with about 25% of them non-immune to malaria (Ref MMP report 2010). 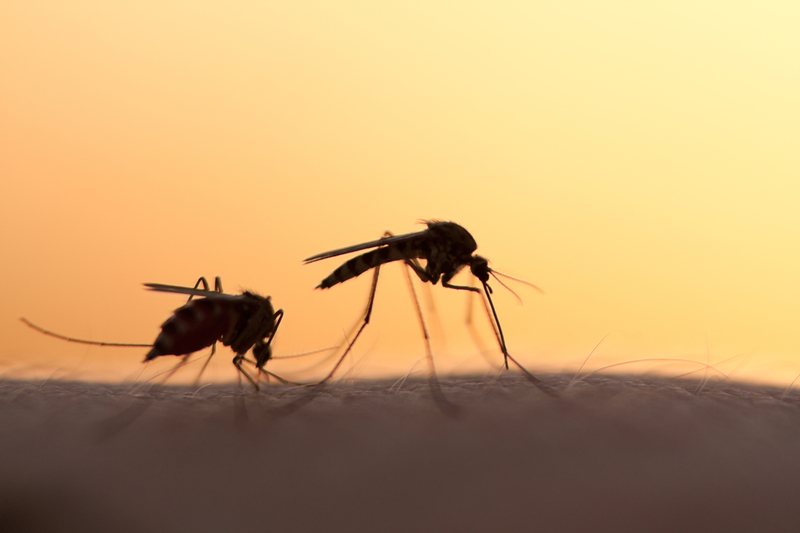 Targeting MMPs is critical to stopping the spread of malaria, as the recent emergence and spread of antimalarial resistant parasites has been linked to population movement between non-malaria areas to malaria endemic areas. Apart from the provision of bed nets, PFD also works to educate the population: From 2012 to 2014 PFD reached over 300,000 people through community based malaria health education, 57,132 school children through school-based malaria prevention interventions, and provided training for over 2000 village health volunteers. Additionally, the survey reported that in 2013 80% of individuals correctly answered malaria related questions during community quiz events and 95% of the children who participated in the school based programs passed along the information on malaria prevention to their family, friends, or other community members through various activities. 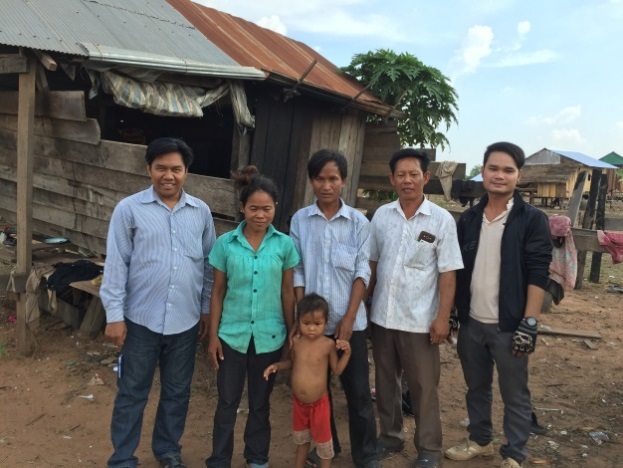 Read more about PFD, our work to fight Malaria in Cambodia, and our other health projects. Multi-drug resistant (MDR) malaria along the Cambodia-Thailand border continues to be a public health challenge. With the recent Ebola outbreak bringing to light the dangers of Partners for Development (PFD) with support from The Global Fund to Fight AIDS, Tuberculosis and Malaria (The Global Fund) is working to eliminate malaria in Cambodia, with special focus on containing drug resistant malaria. Cambodia has seen a significant decrease in malaria cases and deaths over the past decade which has been linked with the efforts of The Global Fund, in part due to PFD’s work in the villages most exposed to Malaria.our increasingly mobile global population combined with infectious diseases, many are fearful of what will happen if the new resistant strain of malaria reaches the rest of South East Asia and Africa. If MDR malaria reaches Africa, experts warn it will cause a severe health crisis. With an estimated 2.13 million people at risk for malaria in Cambodia, and the emergence of multi-drug resistance malaria, continuing the fight against malaria in Cambodia is a primary public health concern. PFD uses a community based strategy: building the capacity of community level partners empowering those partners to sustainably undertake malaria prevention programs in the communities. Currently, PFD builds local capacity by training local Mobile Malaria Workers (MMW) to assess the needs of their communities and manage the distribution of malaria prevention backpacks. These subsidized backpacks, as shown in the photos, which are distributed through a voucher system include: insect repellent, flash light, a long lasting insecticide hammock (LLIH) or net (LLIN), and prevention and care information. PFD is working with the highest risk population, the mobile and migrant populations (MMP) and those who work in the forests in Kratie province, helping to track and prevent malaria. Targeting the MMP population is critical to stopping the spread of malaria, as population movements from non-malaria endemic areas to malaria endemic areas in Cambodia are one of the main factors in the recent emergence and spread of antimalarial resistant parasites. 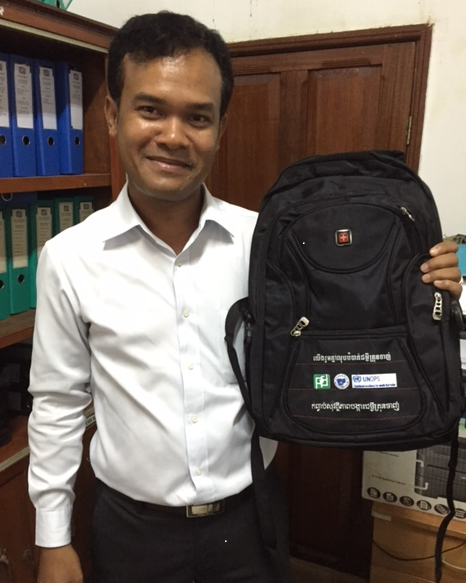 This program is one of many in PFD’s fight against malaria in Cambodia. PFD has spread awareness by training of health workers, teachers, volunteers and Community Councils in malaria prevention and reached thousands through radio broadcasts with malaria and health related messages. In 2014 alone, PFD trained 117 new primary school teachers, 10,150 children as peer educators in malaria health edu¬cation, and 43 new and existing Village Health Volunteers. Historically, PFD has trained over 1,300 teachers, benefitting 30,000 primary school students in health educa¬tion. PFD has also built local capacity of communities by providing funds to eleven Community Councils in Kratie and Koh Kong provinces so that local communities can design and implement malaria prevention activities tailored to the specific needs of their communities. The global fight against Malaria has achieved some success over the past few years with incidence rates and mortality rates decreasing, resulting in an estimated 625 million fewer cases and 4.3 million fewer malaria deaths from 2001 to 2013 (WHO, 2014). Even with the substantial gains made against malaria, World Health Organization estimates remain high at 198 million malaria cases and 584,000 malaria deaths globally in 2013. 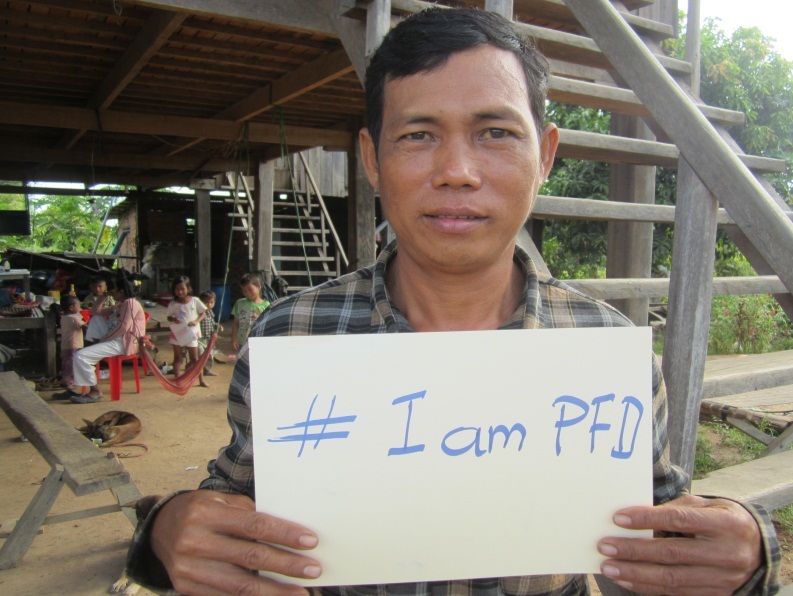 Follow the links to find out more about PFD’s work fighting malaria and programing in Cambodia. 1. According to the Center for Disease Control and Prevention: Antibiotics and similar drugs, together called antimicrobial agents, have been used for the last 70 years to treat patients who have infectious diseases. Since the 1940s, these drugs have greatly reduced illness and death from infectious diseases. Antibiotic use has been beneficial and, when prescribed and taken correctly, their value in patient care is enormous. However, these drugs have been used so widely and for so long that the infectious organisms the antibiotics are designed to kill have adapted to them, making the drugs less effective. Many fungi, viruses, and parasites have done the same. Some microorganisms may develop resistance to a single antimicrobial agent (or related class of agent), while others develop resistance to several antimicrobial agents or classes. These organisms are often referred to as multidrug-resistant or MDR strains. In some cases, the microorganisms have become so resistant that no available antibiotics are effective against them.